Single-Walled Carbon Nanotubes (SWCNTs) are formed by the sp2 bonding carbon atoms and are seamless hollow cylinders made of hexagonal lattice graphitic sheets . The typical size ranges from less than one nanometer (nm) to a few nanometers in diameter and a few micrometers in length. As mentioned above, the SWCNTs have attracted much attention due to the applicability of their enclosed nanospaces and surfaces to engineering [2-11]. Many types of guest materials are encapsulated inside their 1D space, and unusual phenomena have been observed. For example, water molecules inside SWCNTs named ice nanotubes  exhibit novel ferroelectric properties . The most interesting magnetic molecule is the oxygen molecule which is a unique magnetic homonuclear diatomic molecule having spin one (S=1) and has been studied for more than one hundred years [12, 13]. Magnetic properties of oxygen molecules confined in nanospace have been studied considerably, e.g. in a graphitic slit-shaped nanospace  and in microporous metal-organic solids [15-17]. In previous numerical studies , five different structures are predicted depending on the diameter of the SWCNTs ranged from 0.6 to 2 nm. At the temperatures T < 10 K, the narrowest SWCNTs are filled with oxygen molecules having their O-O bond direction aligned to the longitudinal direction of the SWCNTs as shown in the inset of Fig. (1). This geometry of oxygen molecule alignment is named 1DL and the exchange interaction between the neighboring oxygen molecules is expected to be antiferromagnetic . Graphene is a 2D carbon material formed by the sp2 bonding carbon atoms , and is intrinsically diamagnetic due to the pairing of σ and π electrons, except in the states at the zigzag edges [20, 21]. Therefore, considerable efforts for further functionalization have been devoted to introduce Transition Metal (TM) atoms or ions with local magnetic moments into 2D carbon materials. Extensive studies have been made to explore TM-containing 2D carbon nanostructures, and one of them is Poly TM Phthalocyanine (PTMPc) [22-24]. The strong correlation between localized d electrons in TM atom or ion and delocalized π-electron on the poly phthalocyanine frame makes the spin-polarized conduction possible, which is useful for the spintronic application. Furthermore, the 2D porous structure of PTMPc ensures sufficient exposure of TM atoms to interact with reactants, and thus PTMPc may have functions applicable for the electro-catalysis and photo-catalysis. In addition, theoretical investigation suggests that the PTMPCs have high-temperature ferromagnetically or antiferromagnetically long ranged ordered state , which is applicable for magnetic functionalized-materials. In the case of TM=Cu2+ ions where the theory predicts antiferromagnetic coupling between Cu ions, we expect physical phenomena caused by quantum effects due to its small spin value (S=1/2) and two-dimensionality. The SWCNTs sample with an inner diameter of ca 0.8 nm was prepared by the CoMoCAT method  and encapsulated together with oxygen molecules (~400 Torr) into a high-purity quartz tube. After conducting all the magnetic measurements of this sample, oxygen molecules were evacuated and replaced with helium gas. Then, we performed the same magnetic measurements as for the oxygen loaded sample. Since we used the same SWCNTs and quartz tube, the difference between the two samples is nearly identical to the contribution of oxygen molecules . We assumed that the increase of observed magnetic susceptibility at low temperatures would arise from the oxygen molecules outside the SWCNT. Then, we subtracted this contribution, which is fitted by the Curie-Weiss law for S=1 with a Weiss temperature of -3 K, from the total magnetic susceptibility to get the intrinsic magnetic susceptibility of oxygen molecules inside the SWCNT. For the magnetization data, we subtracted the extrinsic magnetization calculated by assuming the S=1 Brillouin function from the total magnetization given by the difference between the magnetization curve with and without oxygen molecules. Powder X-ray diffraction experiments using synchrotron radiation X-rays were conducted at beamline BL8B of the Photon Factory in Japan in order to check the encapsulation of the oxygen molecules inside the SWCNTs, and we found the 1DL alignment of oxygen molecules depicted in the inset of Fig. (1). Poly Cu phthalocyanine and its half-filling counterpart were synthesized according to the methods described in Ref . 1,2,4,5-tetracyanobenzen (tCB) and CuCl2·2H2O, which were purchased from Aldrich Chemical Company, Inc., were reacted at 240 °C for 4 hours in a minimal amount of sulfolane with the catalytic amounts of diaza-bicycloundecene  to produce Cu Octacyano-Phthalocyanine (oCCuPc). Then, Poly Cu phthalocyanine (PCuPc) was synthesized by a solid-state reaction of oCCuPc, tCB, and CuCl2·2H2O in glass ampoules sealed after evacuation (1 Pa). The half-filling PCuPc was synthesized without CuCl2·2H2O. The sealed ampoules were placed into a conventional box furnace and maintained at 425 °C for 48 hours, and then allowed to cool naturally to room temperature. The crystal structures of the PCuPc products were analyzed by the powder XRD method with a Bruker D8 ADVANCE ECO diffractometer, and their TEM images were collected with an FEI Technai G2 20 microscope operated at 120 KeV . From these analyses, the expected structures of PCuPc and half-filling PCuPc are depicted in Figs. (2a) and (2b), respectively. Fig. (1). Temperature dependence of magnetic susceptibility of oxygen molecules encapsulated in SWCNTs. The solid line is the magnetic susceptibility calculated numerically for the S=1 1D Heisenberg antiferromagnet. Inset: schematic of the alignment of oxygen molecules inside SWCNTs with inner diameter of ca 0.8 nm (chiral index (6,5)). Fig. (2). (a) Geometric superlattice structure of PCuPc. Cu, C, and N atoms are denoted with red (large), black (small), and blue (middle) circles, respectively. Hydrogen atoms are omitted for clarity. (b) Geometric supelattice structure of half-filling PCuPc. Magnetic susceptibility of oxygen molecules encapsulated into SWCNTs were measured with a Superconducting Quantum Interference Device (SQUID) magnetometer (Quantum Design MPMS-7XL). To obtain the magnetic susceptibility only from the oxygen molecules (oxygen susceptibility), we also measured the same SWCNTs filled with He gas into the quartz tube after evacuating the oxygen molecules. The intrinsic magnetic susceptibility of oxygen molecules confined into the SWCNTs was obtained by the aforementioned procedure. High field magnetization was measured with a pulsed magnet by an induction method. As mentioned in the subsection 2.1, we subtracted the paramagnetic contribution assuming a Brillouin function from the measured magnetization to get the intrinsic magnetization coming from the oxygen molecules inside the SWCNTs . Fig. (3). 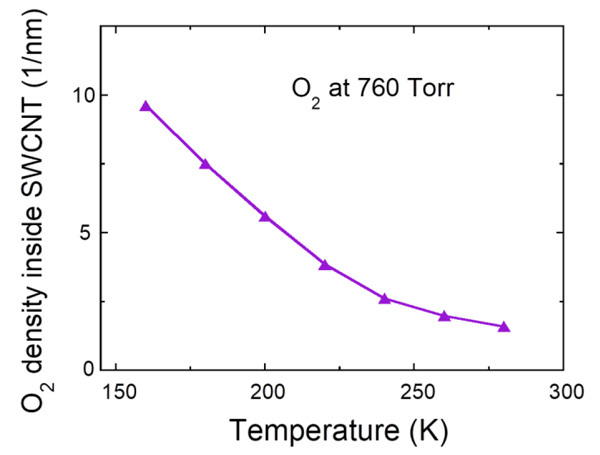 Temperature dependence of oxygen density at 760 Torr inside the SWCNT with the diameter of 1.5 nm. Fig. (4). Magnetization curve of oxygen molecules encapsulated into SWCNTs at 1.4 K. The broken line is the magnetization curve for the S=1 1D Heisenberg antiferromagnet. The temperature dependence of intrinsic magnetic susceptibility (filled circles) is shown in Fig. (1). The intrinsic magnetic susceptibility is compared with the magnetic susceptibility calculated numerically for the S=1 1D Heisenberg antiferromagnet (solid line) . The magnetic susceptibility shows a broad maximum at about 50 K, which is typical of the 1D antiferromagnet and falls down with decreasing temperature, reflecting a singlet ground state with an energy gap to the magnetic excited states. The difference in maximum values between the experimental and calculated magnetic susceptibilities may arise from the imprecise amount of oxygen molecules (6×10-6 mol) evaluated from the oxygen pressure (~400 Torr) and the inner volume of the quartz tube. In addition, the measured magnetic susceptibility decreases steeply at high temperatures and deviates largely from the calculated one. This must be caused by the escape of oxygen molecules absorbed inside the SWCNTs. Actually, oxygen density inside the SWCNTs with the diameter of 1.5 nm at 760 Torr decreases drastically upon heating as shown in Fig. (3). This observation solidifies the fact of the existence of oxygen molecules confined in the SWCNTs at low temperatures. Next, we show in Fig. (4) the intrinsic magnetization curve at 1.4 K (solid line) which is compared with the magnetization curve calculated for the S=1 1D Heisenberg antiferromagnet using the same parameter values as in the magnetic susceptibility fitting (broken line). 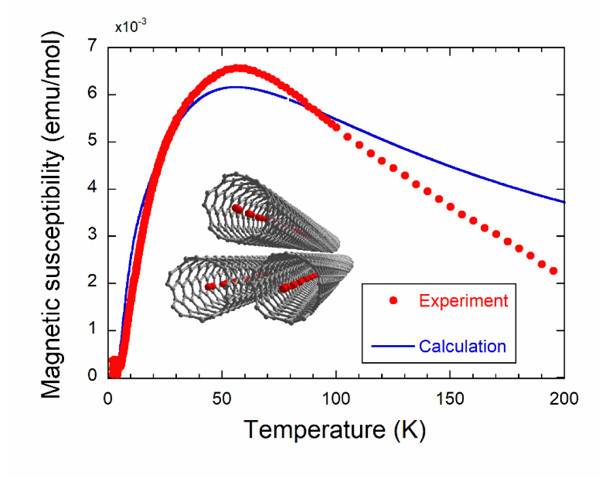 Nearly zero- magnetization appears up to about 10 T and increases almost linearly, which is similar to the magnetization curve of Ni(C2H8N2)2NO2(ClO4), abbreviated as NENP . In contrast, oxygen molecules in micro-porous metal-organic solids exhibit a stepwise increase of magnetization [15-17]. A small hump observed below 4 T is caused by imperfect subtraction of extrinsic magnetization due to oxygen molecules outside the SWCNTs, which is made by assuming an S=1 Brillouin function. The agreement between experiment and calculation is considerably good. The zero-magnetization also indicates the existence of the energy gap between the singlet ground state and the excited magnetic state that is called the Haldane gap . Fig. (5). 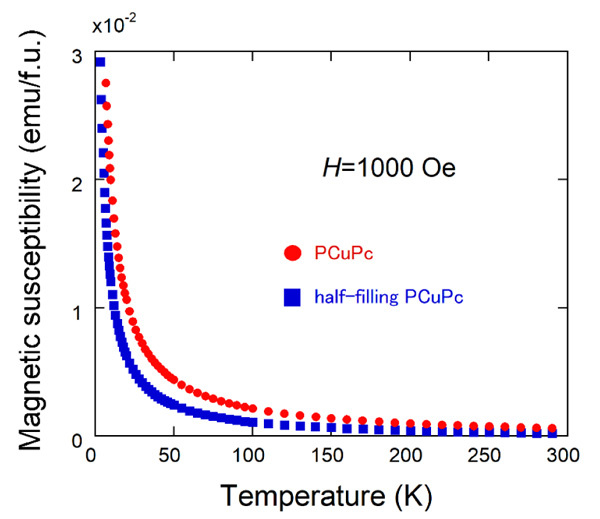 Temperature dependence of magnetic susceptibilities of PCuPc and half-filling PCuPc. Fig. (6). 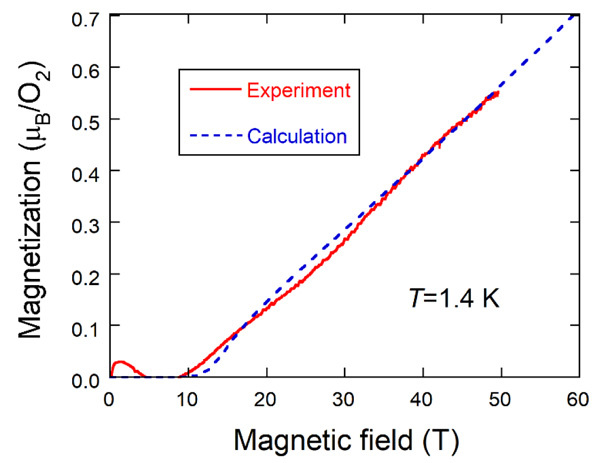 Magnetization curves at 2K in magnetic fields of up to ±7 T for PCuPc and half-filling PCuPc samples. Fig. (5) shows the temperature dependences of magnetic susceptibilities (M/H) of PCuPc (red filled circles) and half-filling PCuPc (blue filled squares) measured at 1 kOe. Both magnetic susceptibilities increase monotonically with decreasing temperature. Here, we used the following formula units: C20H4N8Cu, MW=419.9 g/mol for PCuPc, and C20H5N8Cu0.5, MW=389.1 g/mol for half-filling PCuPc. As expected from the crystal structures of these materials, magnetic susceptibility of the PCuPc is larger than that of the half-filling PCuPc. We expect the magnetic susceptibility of PCuPc twice larger than that of half-filling PCuPc. But the half filling geometric superlattice structure was observed partially in PCuPc by the TEM , and thus our PCuPc sample is a mixture of full-filling and half-filling PCuPcs, resulting in a smaller magnitude of magnetic susceptibility. We merely observed paramagnetic Curie-like behavior probably because of large distance between neighboring Cu ions, resulting in weak exchange interactions between them. 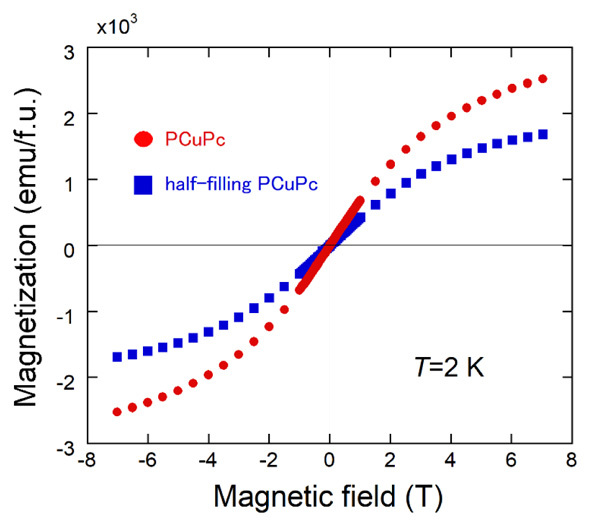 The magnetization curves at 2 K in magnetic fields of up to ±7 T of the PCuPc and the half-filling PCuPc samples are shown in Fig. (6). As in the magnetic susceptibilities, we use the unit of emu/f.u. for the magnetization. Both samples show gradual upward changes near ±7 T. As mentioned above, the PCuPc sample contains partly the half-filling area (Fig. 3b) as in the half-filling PCuPc sample. Thus, the magnitude of the magnetization at 7 T of the PCuPc sample is about 1.5 times larger than that of the half-filling PCuPc sample. From the g-value (2.06) determined by multi-frequency electron spin resonance measurements, we expected the saturation value of magnetization (5750 emu/f.u.) for full-filling PCuPc. But the observed value is less than half of this expected value. As described by Honda et al., broadness of the XRD peak suggests the partial amorphous nature of the reaction product, and therefore Cu atoms may not be contained in some areas of our PCuPc sample . The same situation is observed in the half-filling PCuPc. We also observed paramagnetic magnetization curves in both samples due to the same reason as in the susceptibility measurements. Iijima S. Helical microtubes of graphitic carbon. Nature 1991; 354: 56-8. Smith BW, Monthioux M, Luzzi DE. Encapsulated C60 in carbon nanotubes. Nature 1998; 396: 323-4. Calbi MM, Cole MW, Gatica SM, Bojan MJ, Stan G. Colloquium: Condensed phases of gases inside nanotube bundles. Rev Mod Phys 2001; 73: 857-65. Satishkumar BC, Taubert A, Luzzi DE. Filling single-wall carbon nanotubes with d- and f-metal chloride and metal nanowires. J Nanosci Nanotechnol 2003; 3(1-2): 159-63. Koga K, Gao GT, Tanaka H, Zeng XC. Formation of ordered ice nanotubes inside carbon nanotubes. Nature 2001; 412(6849): 802-5. Hummer G, Rasaiah JC, Noworyta JP. Water conduction through the hydrophobic channel of a carbon nanotube. Nature 2001; 414(6860): 188-90. Maniwa Y, Matsuda K, Kyakuno H, et al. Water-filled single-wall carbon nanotubes as molecular nanovalves. Nat Mater 2007; 6(2): 135-41. Mikami F, Matsuda K, Kataura H, Maniwa Y. Dielectric properties of water inside single-walled carbon nanotubes. ACS Nano 2009; 3(5): 1279-87. Fan X, Dickey EC, Eklund PC, et al. Atomic arrangement of iodine atoms inside single-walled carbon nanotubes. Phys Rev Lett 2000; 84(20): 4621-4. Simon F, Kuzmany H, Náfrádi B, et al. Magnetic Fullerenes inside Sigle-Wall Carbon Nanotubes. Phys Rev Lett 2006; 97: 136801-1-. Hanami K, Umesaki T, Matsuda K, et al. One-Dimensional Oxygen and Helical Oxygen Nanotubes inside Carbon Nanotubes. J Phys Soc Jpn 2010; 79: 023601-1-. Curie MP. Proprietes magnetiquesdes corps a diverse temperatures. Ann Chim Phys 1895; 7(5): 289-405. Onnes HK, Perrier A. Magnetic researches. XII. The susceptibilityof solid oxygen in two forms. Leiden Comm 1914; 139c: 25-32. Kanoh H, Kaneko K. Magnetic Spin States of O2 Confined in a Graphite Slit-Shaped Nanospace at Low Temperature. J Phys Chem 1996; 100: 755-9. Mori W, Kobayashi TC, Kurobe J, et al. Magnetic properties of oxygen physisoebed in Cu-Trans-1,4-Cyclohexanedicarboxylic Acid Mol Cryst Liq Cryst (Phila Pa) 1997; 306: 1-7. Kitaura R, Kitagawa S, Kubota Y, et al. Formation of a one-dimensional array of oxygen in a microporous metal-organic solid. Science 2002; 298(5602): 2358-61. Kobayashi TC, Matsuo A, Suzuki M, et al. Magnetic properties of molecular oxygen adsorbed in micro-porous metal-organic solids. Prog Theor Phys Suppl 2005; 159: 271-9.
 van Hemert MC, Wormer PES, van der Avoird A. Ab Initio calculation of the heisenberg exchange interaction between O2 molecules. Phys Rev Lett 1983; 51: 1167-70. Novoselov KS, Geim AK, Morozov SV, et al. Electric field effect in atomically thin carbon films. Science 2004; 306(5696): 666-9. Yoshizawa K, Okahara K, Sato T, Tanaka K, Yamabe T. Molecular orbital study of pyrolytic carbons based on small cluster models. Carbon 1994; 32: 1517-22. Enoki T, Takai K. The edge state of nanographen and the magnetism of the edge-state spins. Solid State Commun 2009; 149: 1144-50. Abel M, Clair S, Ourdjini O, Mossoyan M, Porte L. Single layer of polymeric Fe-phthalocyanine: an organometallic sheet on metal and thin insulating film. J Am Chem Soc 2011; 133(5): 1203-5. Koudia M, Abel M. Step-by-step on-surface synthesis: from manganese phthalocyanines to their polymeric form. Chem Commun (Camb) 2014; 50(62): 8565-7. Zhou J, Sun Q. Magnetism of phthalocyanine-based organometallic single porous sheet. J Am Chem Soc 2011; 133(38): 15113-9. Kitiyanan B, Alvarez WE, Harwell JH, Resasco DE. Controlled production of single-wall carbon nanotubes by catalytic decomposition of CO on bimetallic Co-Mo catalysis. Chem Phys Lett 2000; 317: 497-503. Hagiwara M, Ikeda M, Kida T, et al. Haldane state formed by oxygen molecules encapsulated in single-walled carbon nanotubes. J Phys Soc Jpn 2014; 83: 113706-1-. Honda Z, Sakaguchi M, Tashiro Y, et al. Phthlocyanine based metal containing porous carbon sheet. Appl Phys Lett 2017; 110: 133101-1-. Wöhrie D, Meyer G. Polymere Phthalocyanine und ihre Vorstufen, 1 Reaktive oktafunktionelle Phthalocyanine aus 1,2,4,5-Tetracyanbenzol. Makromol Chem 1980; 181: 2127-35. Yamamoto S. Quantum-classical crossover in temperature dependence of the magnetic susceptibility of haldane system. J Phys Soc Jpn 1995; 64: 4051-2. Katsumata K, Hori H, Takeuchi T, Date M, Yamagishi A, Renard JP. Magnetization process of an S=1 linear-chain Heisenberg antiferromagnet. Phys Rev Lett 1989; 63(1): 86-8. Haldane FDM. Nonlinear field theory of large-spin heisenberg antiferromagnets: Semiclassically quantized solitons of the one-dimensional easy-axis néel state. Phys Rev Lett 1983; 50: 1153-6.